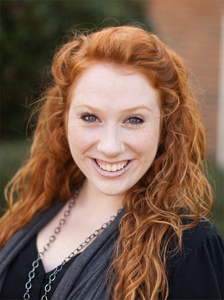 Samford University geography alumna Meghan McCollum of Buford, Ga., has received a $42,667 Rotary Global Scholar Grant to pursue post-graduate study in the Department of Geography, Queen Mary, University of London. The prestigious award--which replaces the well-known Rotary Ambassadorial Scholar program -- is designed in part to develop a cadre of highly educated men and women whose long-term career goals align with the mission and goals of Rotary International and The Rotary Foundation. The Hoover (Ala.) Rotary Club will serve as the International Sponsor for McCollum. The Barkingside Rotary Club in East London will serve as her Host Sponsor. "Meghan is a perfect fit for the Global Scholars program,” said associate professor of geography Jennifer Speights-Binet. “She has the most essential skills for any geographer -- a nagging curiosity about the world, an adventurous spirit, and those critical thinking and problem solving skills that we want all of our students to develop while here at Samford." a course of study that meets one, or more, of The Rotary Foundation’s six Areas of Focus that address the world’s most pressing humanitarian challenges. McCollum’s two areas of focus are economic and community development and basic literacy. Her goal is to work in urban communities in underdeveloped countries, guided by her belief that women and youth will be the catalysts for change in depressed urban environments. She said her aim is to help them “be the change they wish to see in their world” through active participation in rejuvenating and rebuilding their communities using education, learning how access to resources, and becoming knowledgeable about implementing new ideas that will improve the quality of urban living. McCollum said her long term goal is to build on a previous mission experience in Kenya by establishing a school for disadvantaged children and a learning center to help women acquire business and technology training and skills that will enable them to transform their communities into places of hope, prosperity and growth, building not only a new environment for change, but also a new life. McCollum praised Samford’s Geography Department for helping her answer that personal and professional calling. “Long before I knew my own strengths, my professors took a vested interest in my passions and challenged me to go beyond the textbook,” she said. “They taught me that being a geographer was more than being a walking atlas, but being able to recognize the complexities of the world around us, and to always be curious."